The 2015 release of Creative Cloud is here. 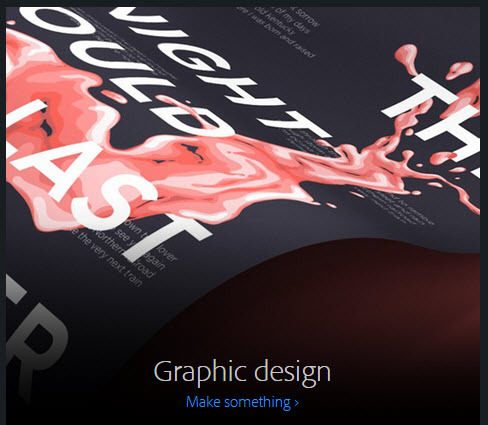 Creative Cloud gives you the world’s best creative tools, always up to date. And now, all the apps and assets — including new Adobe Stock images — are always right where you need them. And everything is seamlessly connected through Adobe CreativeSync technology, so you can easily turn your brightest ideas into your best work across your desktop and mobile devices. It’s all coming together in our biggest update yet. With the 2015 release of Creative Cloud, all your favorite desktop apps have been transformed to help you work faster and more efficiently. You’ll find innovations like artboards in Adobe Photoshop, performance boosts in Adobe Illustrator and InDesign, and new touch features in even more of our apps. And now their power extends to your devices with connected mobile apps, so you can go out and capture inspiration, sample the world around you and make something incredible. If you’re still using Adobe Creative Suite, there’s never been a better time to step up to Creative Cloud. Access all your creative assets anywhere with CreativeSync. Adobe CreativeSync keeps everything you need up to date and at your fingertips across your desktop, web and mobile apps. It automatically syncs your files, fonts, photos, design assets, settings, metadata, Adobe Stock assets and more. It also powers your Creative Cloud Libraries, giving you instant access to your favorite assets right from within your apps. With CreativeSync, you can start a project in any app on any device, pick it up where you left off and finish it anywhere. Introducing Adobe Stock. Millions of high-quality images. Right inside your apps. Find the perfect photo or graphic to jump-start your next project and make it amazing. The new Adobe Stock service offers 40 million curated, royalty-free assets, all available from your Creative Cloud apps in just a few clicks. And Creative Cloud members get special pricing — 40% off Adobe Stock when you add it to your membership. It’s the industry’s best value. Discover new ways to create. See how you can get the most out of Creative Cloud. These tutorials will show you more than just new techniques in your favorite apps. They’ll show you how to extend your creative work beyond your desktop.